No matter what your interests we can suggest weekends, short breaks or complete holiday vacations that will interest, entertain and surprise you - not just in the cities like Bergen Stavanger and Kristiansand, but also in the mountains, fjords and ski resorts. From a city break of museums and culture; sightseeing the mountains and fjords by car or boat; or a weekend of skiing in the mountains combined with city nightlife - take a look - what would you like to do on your next break? Don't relax! 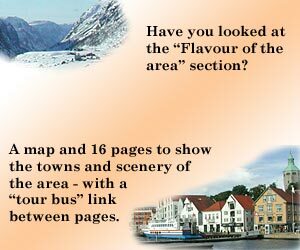 Take the skibus to Sirdal, ski all day, rest on the bus back to Stavanger, then go out on the town. Sound easy? Do it all again tomorrow! Stay in Stavanger, take day-trips to visit the best of the sights, plus good shopping and restaurants in the city. Starting from Haugesund or Bergen, spend a (long) weekend driving around the Hardangerfjord region, enjoying the magnificent sights and the different pace of life - don't forget your ferry timetable! Stay in one, two or more lovely hotels along the way. Take the tourist ferry from Stavanger through Lysefjord, look up at Pulpit Rock and Kjerag, then drive up and over the mountains to Sirdal and come back through Hunnedalen to Stavanger. This tour takes you from Stavanger through the sheltered islands of the Ryfylke to Sauda, then over mountain passes to Hovden in Setesdal, over the Suleskar road to Sirdal and on the Lysefjord ferry back to Stavanger. It takes a minimum of 3 days but if you want to have time to see and do everything along the way then take a week or more over it. Get off the main road and discover another world amongst the islands. Stay in Stavanger, Hjelmeland and Sauda. This can be a long weekend, or get into serious relaxation mode and spend a week here. This tour takes you from Stavanger through the sheltered islands of the Ryfylke to Sauda, then over mountain passes to Hovden in Setesdal, over the Suleskar road to Sirdal and on the Lysefjord ferry back to Stavanger. It takes a minimum of 3 days but if you want to have time to see and do everything along the way then take a week over it.